Once a location I never thought I would enter, I found myself at Scott's for happy hour before Book of Mormon. I was pleasantly surprised. Although my friend refuses to go here (there was a health code violation issue, and lets just not go into it right now), my Aunt and Uncle wanted to grab drinks and then head to the show. The happy hour is decent - it is from 3-6PM. It is a typical OC place where happy hour means drinks are only a dollar or two off (why can't it be like the Midwest and have penny pitchers?) 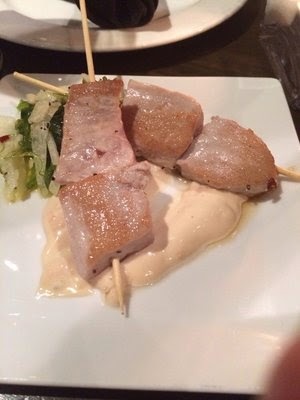 and the small bites are 50% off (but they do have a $6 burger). I got a mule which was fine, but wasn't in the copper mug - that really irks me. The bar area is huge and can fit many people, and has tables and chairs all over so you aren't standing up like 3Thirty3. 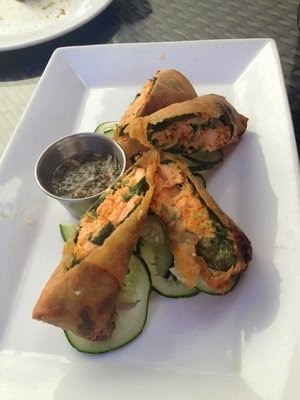 The highlight of the happy hour was the salmon spring rolls though. They were delish and not badly priced. I would go back purely for that.